In second pAsuram, AzhwAr highlights the favours done by emperumAn for him and becomes displeased thinking “You, who is such benefactor, have not arrived even after my calling out with sorrow”. Subsequently, AzhwAr says “If I call you out highlighting your magnanimity of making me exist fully for you and enjoy you, you have not arrived to be seen by me and have not presented yourself to me”. Second pAsuram. AzhwAr highlighting emperumAn‘s previous favours, says “Is it reasonable for you who favoured me and revealed your nature to me, to not arrive in front of me when I call out for you now?”. en vaLLalEyO – Oh my great benefactor! kaLLam mAyA – Oh amazing person who is present in the heart (being invisible like a cheat)! vandhu IyAy – have not arrived and given yourself. Oh vAmana who measured bhUmi with intent! Oh my great benefactor who is truly bestowing the limitless ocean of bliss which is without any faults, for my enjoyment! Saying these with dejection in the middle of the night and in the daytime when objects are clearly visible, if I call out “Oh amazing person who is present in the heart!”, you have not arrived to be seen by my eyes and given yourself. AzhwAr implies “come and give yourself to me”. The “O” in the words “vaLLalEyO!” and “vAmanAvO!” indicates the sorrow of AzhwAr. koLLa mALA inba veLLam – Ocean of bliss which never saturates even after enjoying repeatedly. [Did emperumAn give bliss to AzhwAr?] He is explaining what was explained in thiruvAimozhi 4.5.3 “vIvil inbam miga ellai nigazhndhanan” (being in the ultimate state of continuous bliss). kOdhila thandhidum – Fault in the bliss is – leading one to be satisfied after enjoying once, causing one to desire for other matters; this bliss is unlike that; it increases the desire for enjoying repeatedly and also causes detachment towards other enjoyments; thus, bestowing faultless and limitless ocean of bliss. en vaLLalEyO – While bestowing you gave it as if it is for your benefit, but now you have made it appear that it is for my benefit and are you waiting for me to call out for you? vaLLal (magnanimous person) means favouring others as if it is a benefit for oneself. The nature of him who bestowed himself is explained in “Anandhamaya:” (embodiment of bliss), “AnandhObrahma:” (brahmam is bliss). If you were planning to make me call out [with agony] like this, why did you give such enjoyment in thiruvAimozhi 4.5 “vIRRirundhEzhulagu“? It appears that emperumAn gave some joy for the little AthmA – AzhwAr referred to himself as “siRiyan” in previous pAsuram. vaiyam koNda vAmanAvO – Are you not of the nature that you will [even] beg for those who beg to you? To eliminate the tears of indhra who fell at his feet saying “I lost all my three worlds”, he who is Sriya:pathi (lord of SrI mahAlakshmi) himself took up the form of a seeker; alas! instead of you eagerly bestowing yourself to me, you are making me call out for you! enRu enRu – AzhwAr is not like indhra who left after getting his kingdom back; nor is he like mahAbali who manifested audhAryam (generosity) [towards emperumAn himself]; instead he keeps repeating this [vAmana avathAram] only. 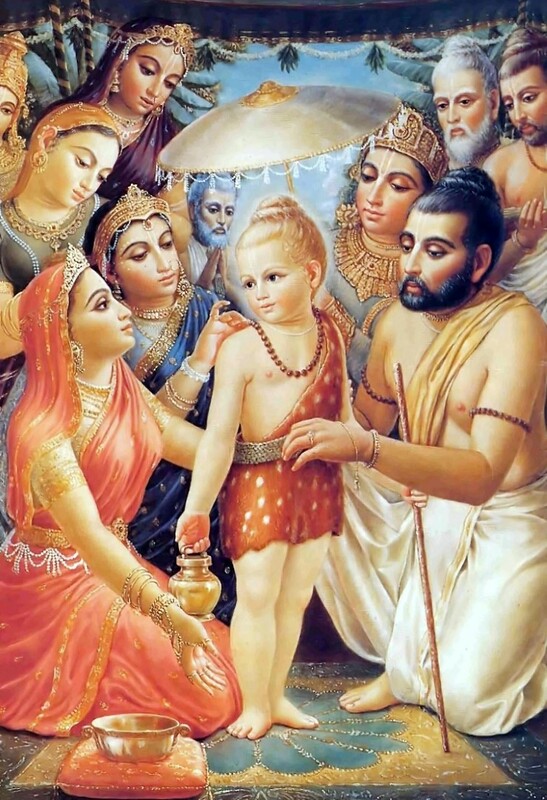 Even after measuring and accepting the worlds [as thrivikrama], AzhwAr’s divine heart was still engrossed in the [previous state of] vAmana form only. naLLirAvum nanpagalum – naL indicates middle and abundance/darkness; it also indicates the unique sound in the night when all other sounds subdue. By all of these, it indicates the middle of the night. As said in katavalli upanishath 2.5 “ya Eshu supthEshu” (one who is awake [and protecting] when everyone is fast asleep), you are making me aware and call out for you, while you are the one who is awake and caring for everyone! nanpagal – AzhwAr is saying “good day” since his contact/relationship with bhagavAn is unchanging whether it is thiruvAimozhi 4.6 “thIrppAraiyAmini” or thiruvAimozhi 4.5 “vIRRirundhEzhulagu“. [Only] when other matters are experienced, when emperumAn is not seen, the mind/heart will think about the other matters. Alternatively, “nanpagal” is like chevvAykkizhamai (Tuesday) [which is usually considered to be inauspicious] being called “mangaLavAram” (auspicious day) [This is called viparItha lakshaNA – contrary identification], since he was not seen, this time is considered as empty/useless time. nAn irundhu – Me who is very weak and not having ability to call you. nAn irundhu – Me who enjoyed ultimate bliss previously. OlamittAl – if I call out. kaLLa mAyA – Oh amazing lord who is invisible to the eyes, but unforgettable in the heart! unnai – Distinguished you without whom I cannot sustain myself; because you have a beautiful form. en kaN kANa – to be seen by my eyes which desire to see you. vandhu IyAyE – You have to come and walk in front of me for me to witness that beautiful walk and sustain myself. As said [by SrI rAma] in SrI rAmAyaNam sundhara kANdam 66.10 “najIvEyam …” (I cannot sustain in your separation even for a moment) and SrI rAmAyaNam AraNya kANdam 10.9 “… hrIrEshAhi …” (I am ashamed to have made you wait [to the sages]), when he appears, he makes other think “there is nothing wrong with him” [even if he comes late]. You should come and present yourself to us. kaN kANa vandhu IyAy – Just the experience in mind is not sufficient; you have to physically appear in front of me. It can also be read as “IgiRilai” which means “you are not appearing in front of me” and this goes along well with “seyvinaiyO peridhAl” (my sins are huge). Another explanation – Please come and give. This entry was posted in thiruvAimozhi, thiruvAimozhi 4th centum on March 15, 2017 by Sarathy Thothathri.